Are you looking for low carb success? Follow my ABCs and you’ll be well ahead of the game! I’ve been following a low carb diet since 2008 – so although I’m not a dietician, I know a lot about it! Here are my top tips for low carb success. A is for Activity. Whether it’s the gym, sport, or both, when you pair exercise with a low carb diet, you are going to see results. 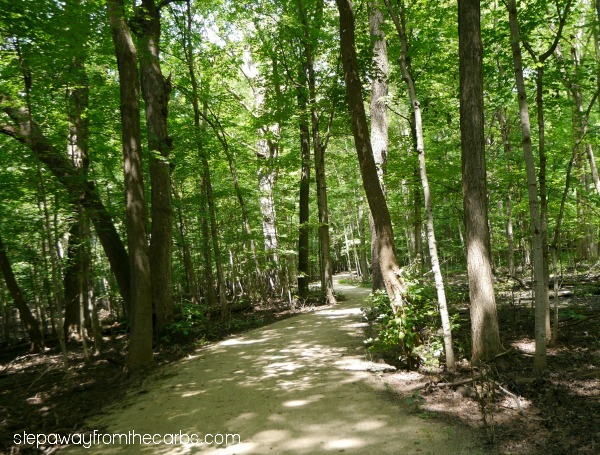 Although organized exercise isn’t for everyone, doing some kind of daily activity is absolutely essential. Try setting an alarm on your phone every day to remind you to do SOMETHING, be it walking in the park, dancing to your favorite song – whatever works for you! B is for Before and after photos. Whether you share them with others or not, there’s nothing more encouraging than seeing how far you’ve come when you see photos of yourself wearing the same clothes and how they fit differently. C is for Cauliflower. If you’re missing rice or mashed potatoes, cauliflower really is the best substitute – and healthy, too! If you aren’t keen on the smell or taste, experiment with different cooking methods and flavorings until you find a recipe that works. You can buy cauliflower already riced these days, too – perfect for making a pilaf! D is for Diet buddy. If you feel like you’re having trouble keeping on track, find yourself a diet buddy! If you’ve already seen some weight loss by cutting out the carbs, chances are your friends and family know what you’re doing. I’m sure that you know someone who would like to try this diet, too! Help yourself to keep motivated by checking in with your buddy on a regular basis, exchanging recipes that you’ve tried, and trying to beat each other to the next goal! E is for Exercise. I’ve already mentioned Activity – and depending on your fitness level, your requirements will be different. But the unavoidable fact is that your weight loss will be faster if you exercise regularly as well as reduce your carbohydrate intake. And as an added bonus – you’ll be strengthening muscles and getting your body toned. F is for Fish. Don’t forget that all seafood and shellfish is ultra low in carbohydrates! It’s super good for you too, so try and work fish into your diet at least once a week – and not just shrimp! If you need some ideas, here are over 12 low carb fish recipes for you to try. G is for Goals. 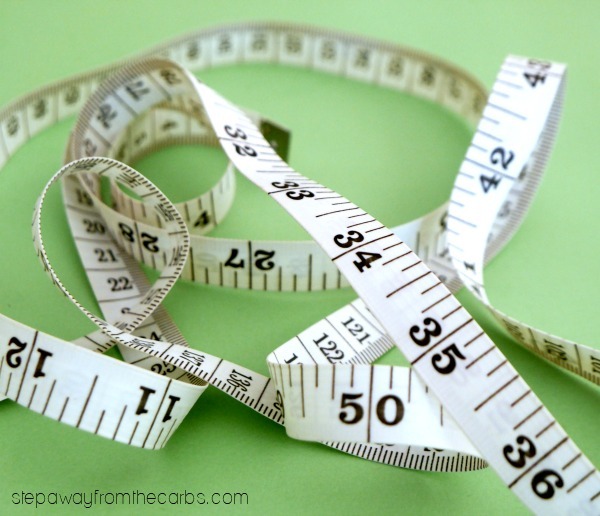 These can be long term or short term, and can be related to measurements, weight, or fitting into a particular garment. Consult your doctor or physician to get their recommendations, and make sure you know what your bmi (body mass index) should be. H is for Hacks. Everyone loves a good hack! I have a load of low carb hacks for you to try, including convenient substitutions for chips, crackers, fries, pizza, and more! I is for Inspiration. Check out Instagram and Pinterest and follow some low carb profiles. Seeing all those photos of delicious low carb recipes will definitely inspire you to keep going. J is for Just ask. Struggling with a possible side effect? Want a good alternative to your favorite meal? Find online forums, Facebook groups or ask right on this post in the comments below. My VIP membership group has a private no-judgment Facebook group if you’re looking for some help and support! K is for Ketosis. Keeping your body in ketosis is essential for this way of eating. Simply put, ketosis is when the body does not have reserves of glucose to convert to energy, so it burns fat instead. When your body is in ketosis, the level of ketones are increased, which can be detected in your blood or urine. Keto testing strips can be a useful way to find out how close you are to ketosis, especially in the early stages of a low carb diet. M is for Meal plan. Starting a whole new diet can be totally overwhelming. We’ve all been there! I’ve put together a free 7-day meal plan to help you out, and also a fully comprehensive 14 day meal plan that comes with recipes, shopping lists, snack ideas and more. Once you get a feel for this way of eating, you’ll never look back! N is for Never go hungry. There’s no real excuse to go hungry on this diet. Just find the right low carb foods that work for you, and eat them in moderation. O is for getting Organized. Whether you’re a Pinterest board person, a printed cookbook person or an internet-print-out person, make sure that you have everything well organized so that you can find the recipe you need. And if you print out a recipe and love it – make sure you keep it! 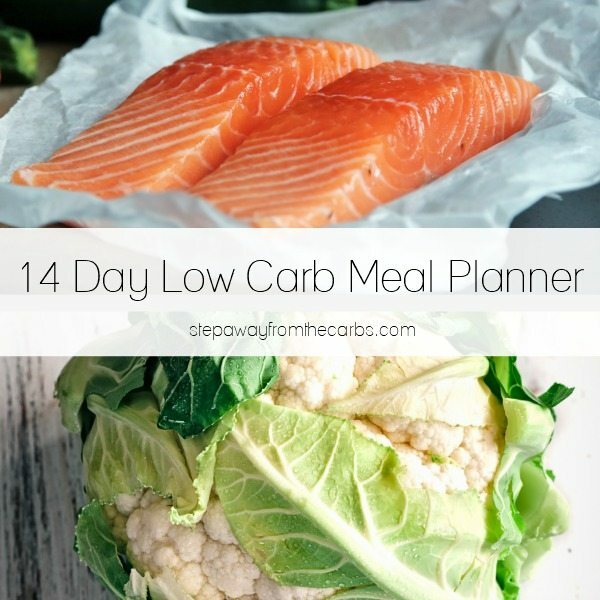 Store the recipes in a binder, sorted by category with these low carb recipe binder printables! P is for Preparation. Whether it’s meal planning, cooking freezer meals, or making sure you have a low carb lunch ready to take to the office, you need to be prepared. Lack of advance planning means that you either go hungry (NOT acceptable!) or you eat carbs. Recipes like my layered breakfast muffins or cauliflower and cheese muffins can be super handy! Q is for Quick and easy snacks. Most people who have struggled with their weight LOVE snacking. The solution? Make sure you have low carb snacks available at all times. They don’t even have to involve much cooking, either – check out my store-bought low carb snack ideas or my low-prep low carb snack suggestions. R is for Record what you eat. Especially when you are starting out, recording everything that you eat will make you see instantly how many carbs you are eating each day. There are a ton of different apps that do this. If you accidentally eat something that is high in carbs, your food tracker will make that very obvious, so you are less likely to make that same mistake. It can be a lot of work at the start, but most apps tune into the food items you consume on a regular basis, so it gets easier within a matter of days. S is for Shirataki noodles. These are available in many shapes and sizes – including rice! Everything you need to know about how to prepare and cook them can be found in my Ultimate Guide to Shirataki Noodles. There are many brands available; my current favorite is Miracle Noodles, available from Amazon and many other online stores. T is for Tortillas. I wouldn’t be stretching the truth too far if I said I’d be lost without low carb tortillas. They ensure that I never go hungry, because you can pretty much put anything in a tortilla wrap and call it a meal! I’ve also made them into taco shells and tortilla chips, which are perfect for nachos! There are many popular brands to choose from, and you can buy them in most big grocery stores and also online. Check out my tortilla comparison and review for some ideas. U is for Understand what works for your body. Everyone is different, and there are many kinds of low carb diets. Just because one person says you can’t have a certain food item, doesn’t mean that you can’t. You’ll see a lot of strong opinions online about various aspects of low carbing – sweeteners are a classic example. Find what works for you, your body, and your lifestyle. V is for Variety. Don’t get stuck with the same old recipes so that your diet feels boring. 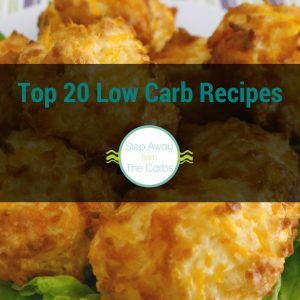 Buy low carb recipe books, subscribe to newsletters from your favorite low carb blogs, or join Facebook recipe groups like this one. W is for Water. I won’t be the first or last person to recommend drinking a lot of water to you! But it’s essential. Try switching things up by adding flavored water enhancers. X is for occasional eXcess carbs. This way of eating is hard, and even the most strong-willed people will have the occasional cheat. But as long as you go straight back to low carb eating with the very next meal, the impact shouldn’t be too bad. Just don’t do it too often! Y is for You can do it! This way of eating works for most people, so stick with it and you WILL see results. If you need help staying on track, download my low carb motivational pack! Z is for Zero carb foods – that is to say, food that has less than 1g net carb per serving. Check out my list of 43 zero carb foods – it’s useful to know in case you have gone over on your carb count! 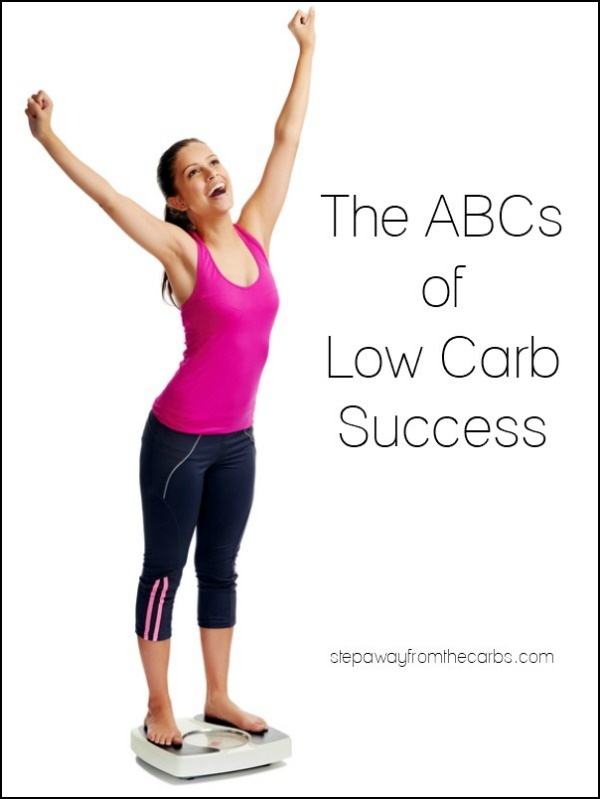 I hope that you’ve found this list for low carb success helpful! If you have any other tips to add, please leave them in the comments! Thanks for sharing your thoughts and experience with this diet. I can see that it has helped you and I want to congratulate you on that achievement. That is great!